Porcelain veneers are a thin piece of porcelain used to recreate the natural look of teeth. It is often the material of choice for those looking to make slight position alterations or to change the shape, size, or color of your tooth. Veneers are used in teeth that have developed poor color, shape, or contours. They are also used for fractured teeth, gaps between teeth, and when there are minor bite related problems. During your consultation, your dentist will help you determine if veneers are right for you, or if there are alternative solutions available. We understand that this is an important improvement in many people’s smile and we really care about meeting your goals with your veneer. To apply a veneer, a very small amount of your tooth will first be removed (usually less than a millimeter). This allows room for the veneer to fit within the mouth and most accurately restore natural tooth function to give you the aesthetic look you desire. 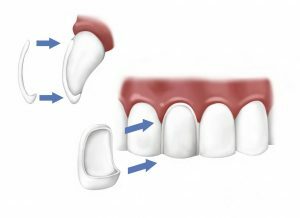 We will then take impressions of your newly shaped tooth and send it to the lab to create your porcelain veneer. After a week, your new veneer should be ready and when you come into the office we will bond it to your tooth. This bond will help provide the strength for long-term success. Return to normal eating can resume after your new veneer is bonded. You may experience an initial sensitivity to biting or temperatures. If this continues, please contact us for another look. Take care not to bite into very hard things such as fingernails, chewing ice, or opening beer bottles. You may have some mild soreness or sensitivity after your initial appointment. This will go away after your permanent veneer is placed but you may rinse with warm salt water or take a mild anti-inflammatory such as Advil for relief. Normal oral hygiene is all you need to maintain your veneer. If you clench or grind your teeth, your dentist may advise a bite guard to help protect your veneers.